Stock photo of a large white cross (Cruz del Castillo) at Castillo de Santa Catalina at sunset, City of Jaen, Province of Jaen, Andalusia (Andalucia), Spain, Europe. 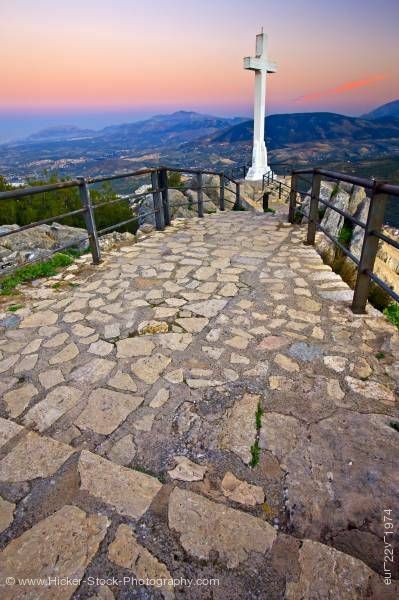 A stone walkway leads to a large white cross at the Cruz del Castillo overlooking the city of Jaen. This stock photo shows a large white cross (Cruz del Castillo) at Castillo de Santa Catalina at sunset, City of Jaen, Province of Jaen, Andalusia, Spain, Europe. A smooth well worn stone walkway leads to a large white cross sits on a rocky ledge known as the Cruz del Castillo near the historic Castillo de Santa Catalina. The white cross sits overlooking the City of Jaen. The stone walkway and the safety of the guard rails shows an amazing view of the town and the beautiful mountains in the background during the evening glow at sunset. Over the city of Jaen and its mountain peaks, the hazy evening sky casts wonderful hues of blue, purple, pink, and orange. Large white cross (Cruz del Castillo) at Castillo de Santa Catalina at sunset, City of Jaen, Province of Jaen, Andalusia (Andalucia), Spain, Europe.